RUSSIAN sounds familiar to Yoi Hasegawa, an 85-year-old resident of Nemuro, a small port on the north-eastern tip of Japan. She still remembers a few words from when she was 13, and lived on the nearby island of Etorofu. 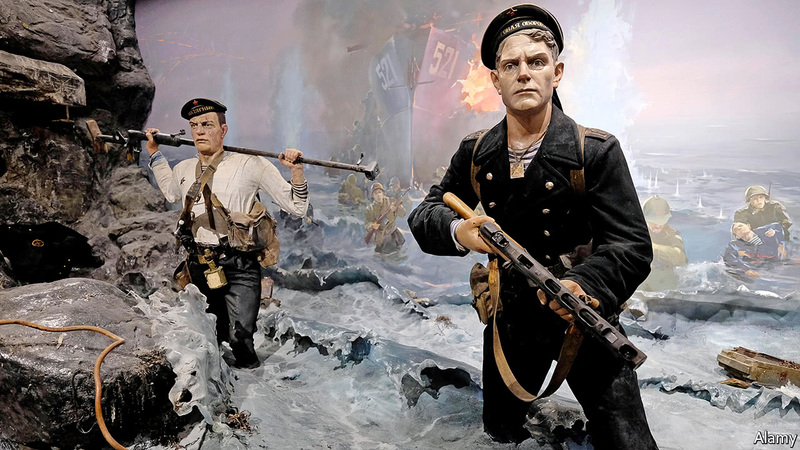 Japan had just surrendered to the Allies, ending the second world war, but Stalin, who had only declared war on Japan seven days before its capitulation, was eager to seize territory Roosevelt and Churchill had promised to the Soviet Union. He sent troops to occupy the southern Kuril Islands, which Russia had acknowledged as Japanese territory in 1855. Two years later, after Ms Hasegawa had picked up a little Russian, he deported the Kurils’ Japanese inhabitants. The resulting territorial dispute mars Russo-Japanese relations to this day. 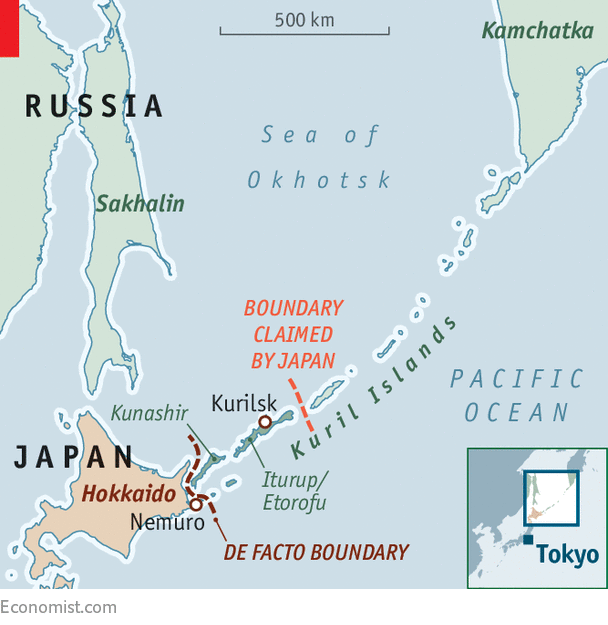 Like his predecessors, Japan’s prime minister, Shinzo Abe, would dearly like to reclaim the Northern Territories, as Japan calls the southern Kurils (see map). But Vladimir Putin, Russia’s president, is better known for taking territory than giving it back. The Japanese government hopes that engagement with the new Russian inhabitants of the islands and investment by Japanese firms in what is, after all, a poor and isolated corner of Russia, may gradually soften local hostility to anything that seems like a territorial concession. Mr Abe has a personal stake in this charm offensive: his father and grandfather, as foreign minister and prime minister respectively, tried to secure the Kurils’ return. Some sort of deal (“shared sovereignty” is a phrase bandied about a lot in Tokyo) would fulfil a cherished goal and remove a huge impediment to closer ties. Ms Hasegawa has been a beneficiary of Mr Abe’s diplomatic overtures—but it has been a long time coming. Soviet troops arrived at her house in late August 1945. “They did not take off their shoes,” she says, “and they had automatic rifles.” She was afraid about what they might do to her 17-year-old sister. “My father had samurai blood in him and told them that they would have to kill both of them,” she recalls. But in the end they did nothing worse than steal some of the locals’ valuables. For the next year the Japanese residents and the Russian invaders lived next to each other. Old Japanese ladies helped to deliver the babies of the Russian women who had come to join their husbands in the local garrison. The Russians supplied the Japanese with clothes and some food. Ms Hasegawa would walk three kilometres to a place where Russians lived to exchange potatoes for sugar. Then, in 1947, ships arrived and took all the Japanese away. They were allowed to pack one bag and given 24 hours to get on board. Many families buried their belongings in the garden, expecting to be back soon to retrieve them. The boats took them to Sakhalin, a nearby island once divided between Russia and Japan but by then wholly in the hands of the Soviet army. After a few months in barracks there, they were sent to Hokkaido, Japan’s northernmost island. In June a boat took Ms Hasegawa back to the island she left 70 years ago, now renamed Iturup. The village where she was born has long been abandoned. Only bears live there now, the locals say. Most Japanese buildings were burnt or demolished in the 1970s. Streets and villages have been renamed. A few gravestones are the only obvious sign of the long Japanese presence on the island. The main town, Shana, has become Kurilsk. It is a settlement of just 1,500 people who mostly live in Soviet-era apartment blocks. It was in one of those blocks on the unpaved Lenin Komsomol street that Ms Hasegawa met Tatiana Vasilieva, who is 63. Like Ms Hasegawa, Ms Vasilieva was born on Iturup. Her father was one of the Soviet soldiers who came to “liberate it” in 1945. Her family lived in the village where Ms Hasegawa once sold potatoes. Ms Vasilieva believes the Kurils must remain Russian, but she feels sorry for the former Japanese residents. “Deportation was a tragedy for them, as it would have been for me,” she says. The Japanese government has a different view of Russia from its Western allies. They regard it as a disruptive force, to be fended off, whereas Japan sees a potential counterweight to China’s growing power. That is an especially desirable attribute at a time when America’s commitment to the region seems less certain. But Russia has sold China advanced offensive weapons, including SU-35 jets. Mr Putin seems to get on well with Xi Jinping, his Chinese counterpart. “We need to get Russia to our side, or at least to drive a wedge between Russia and China,” a senior Japanese diplomat says. The Kurils are a secondary issue, but not to Mr Abe. “It is his personal project. The majority of the Japanese people, particularly the young ones, don’t care about it,” says a Japanese analyst. Mr Abe has met Mr Putin 20 times, with the Northern Territories always on the agenda. During a summit a year ago he handed Mr Putin a letter from former residents of the Kurils. “We don’t have time… We want to return to the islands…We want to go and return freely,” they wrote. According to Mr Abe, Mr Putin read the letter and agreed right away to ease travel to the islands for former residents and to initiate various joint development schemes. In return for being allowed to bring elderly Japanese to visit the graves of their relatives, Japan regularly ferries Russians living in the Kurils to Hokkaido, for a holiday at Japanese taxpayers’ expense. 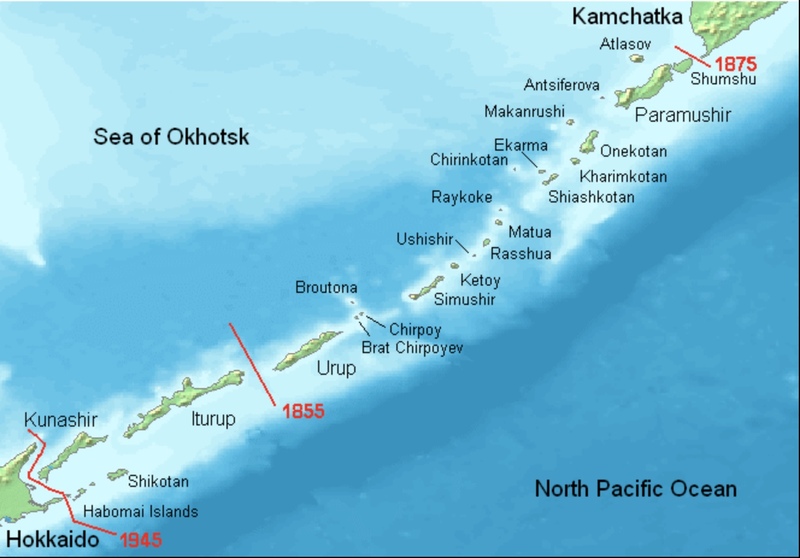 The Kurils, home to just 20,000 people, are extremely isolated. There is one ferry a week to Sakhalin, the main link to the outside world. The few flights in and out are prohibitively expensive. Internet access is scarce and mobile reception sporadic. There are only 13km of paved roads. To get around the islands, locals tend to drive along the beach—something that can be done only at low tide. To induce people to live there, Russian law requires employers to pay workers in the Kurils double what they would earn on the mainland. The Russian government has declared Iturup a special economic zone, with tax breaks for investment. The governor of the region, Oleg Kozhemiaka, says the Kurils are open to Japanese investors. He has lobbied successfully for the easing on Iturup of border-zone regulations that make it especially hard for foreigners to do business. But the less onerous rules apply only in Kurilsk and a few other spots, not including the island’s port. That makes them next to useless. When a group of Japanese businessmen visited in June, they were not allowed to deviate from a pre-agreed itinerary. It does not help that fishing, the port and most other businesses on the islands are in the hands of a single oligarch, who is presumably not eager to see competition. Japan’s overtures do not seem to have engendered much goodwill. Natalia Beskrovnaia, a managing editor of Red Lighthouse, a local newspaper, who has been on a free trip to Japan, says, “I am against any Japanese presence in the Kuril Islands. We should not let them in. I am against this visa-free exchange. They want to grab our resources.” The realisation of Japan’s economic superiority makes young people fearful of Japanese investment. “If they come here, we would be their servants and I don’t want that,” says Ms Vasilieva’s daughter. Elena Kairova, the curator of a local museum, echoes her misgivings: “Why do we need the Japanese here? So that they can catch our fish? Let them catch their own fish. They are very cunning. They want to open their restaurant here. Why do we need that? We can eat our Russian food,” she says. The siege mentality is exploited and fanned by the authorities. Last month the army said it would install anti-ship missiles in the Kurils. Focusing on imagined external threats diverts attention from the local elites, who show scant regard for the well-being of the islanders.